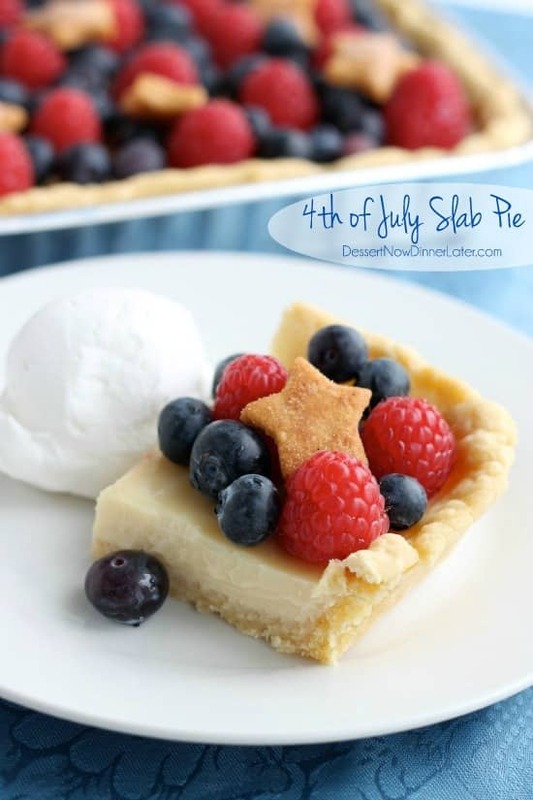 4th of July Slab Pie - Dessert Now, Dinner Later! You guys have no idea how excited I am about today’s recipe! We ate this amazing pie/tart for breakfast day after day until it was gone, and my husband and I were both sad when we finished it! It’s like all of my favorite things in one dessert and it’s SO PRETTY to look at! 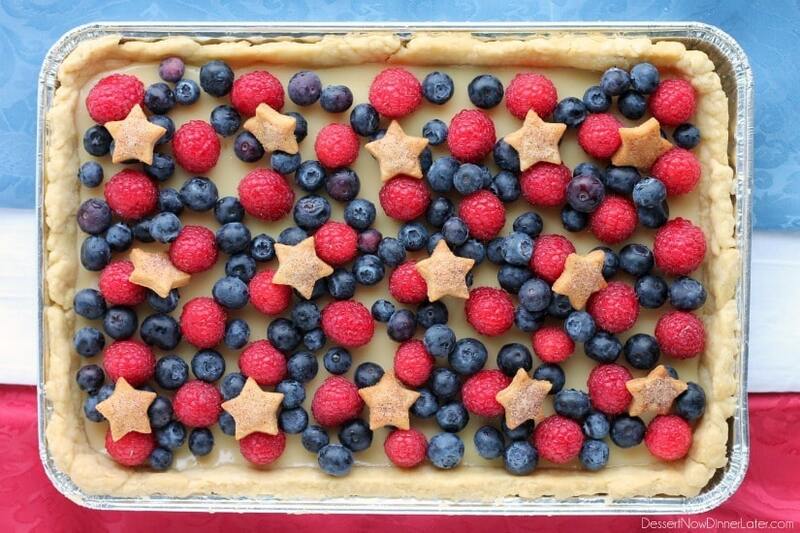 You can imagine all the “ooh’s and ahh’s” you will get when you bring this dessert to your 4th of July party! And you can bet it will be the first one to get gobbled up! 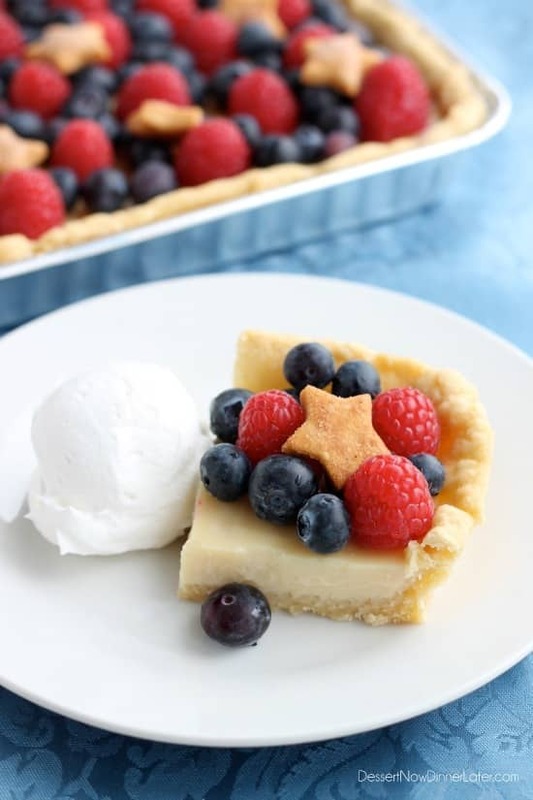 It really is one of the best 4th of July desserts I have ever eaten! This dessert is called a “slab pie” because it has pie crust, but is in a rectangular dish, so it serves more people. The crust isn’t so fancy either, except for the star cut-outs, so it’s kind of thrown together fairly easily. 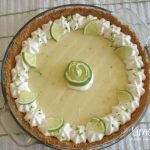 The filling on top of the crust is just like you would put in a key lime pie, but has lemon juice in it instead of the limes. It’s not super tangy, and pairs beautifully with the fresh berries on top. Add a little cool whip on the side and you have the most amazing dessert! Combine flour and salt in a large bowl. Stir. Cut in shortening with a pastry blender, two forks, or pulse in a food processor until pea sized chunks are achieved. 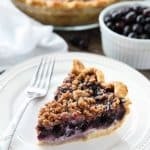 You do not want to crumble this mixture because those little balls of shortening are creating pockets of air in your pie crust, which become the flakey layers you want to achieve. Add the egg, 5 Tbsp cold water and 1 Tbsp white vinegar. Mix with your hands. Keep adding water 1 Tbsp at a time until the mixture is less crumbly and is starting to come together. Empty the contents from the bowl onto the counter. Continue to add just enough water for the dough to come together, but not be sticky. Cut dough into 2 pieces, 1 large and one small, and flatten into 2 discs. Saran wrap the discs and place them in the freezer for 15 minutes. This gives the dough time to rest & keeps the shortening solid, since you want those flakey layers. Remove the large piece of dough and roll it out on a floured surface into a rectangle about ¼-inch thick. Lay the pie crust into a 7½ x 11½ x 1 -inch foil pan* (these are approximate measurements, but you will only want the pan to be 1-inch tall) and shape it to fit the pan, don't stretch the crust because it will shrink a little bit during baking. Sink the crust down on the sides and trim any excess. Place foil pan onto a small baking sheet for support. Poke crust all over with a fork. 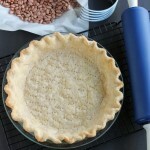 Remove the small disc of pie dough from the freezer, roll it out on a floured surface until ¼-inch thick. Using a star shaped fondant cutter, cut 14+ stars and place them on a non-greased baking sheet. Sprinkle cinnamon sugar on the top of the stars and bake the crust and stars at 350 degrees Fahrenheit for 15 minutes or until the crust is light brown and baked through (no longer looks wet from the shortening). 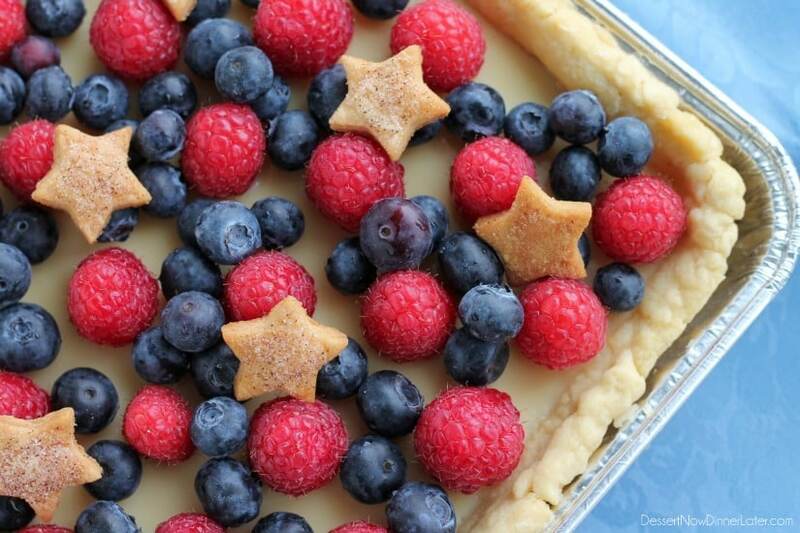 Remove the crust and stars from the oven. In a medium sized bowl, whisk together the condensed milk, egg yolks, salt, and lemon zest and juice. Pour the lemon filling into the hot pie crust and bake for an additional 15 minutes until the filling is set. 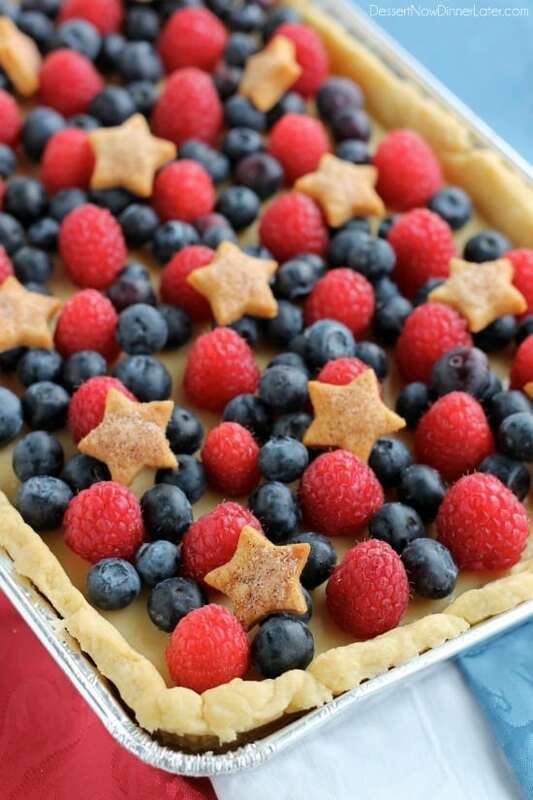 Allow pie to cool, then top it with raspberries, blueberries, and pie crust stars. Keep covered in the fridge until ready to serve. 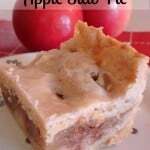 Cut into 12 or 15 squares and serve with cool whip. *I got my foil pan in a 2-pack at Dollar Tree. Thanks! It was fun to make and even more delicious to eat! I’m loving all of your fun Fourth of July treats! This is the perfect thing for a party! And it’s beautiful! Pinned! I loooooove the idea of this! I’m so not a pie maker but I think I could handle this! This looks delicious and so pretty! 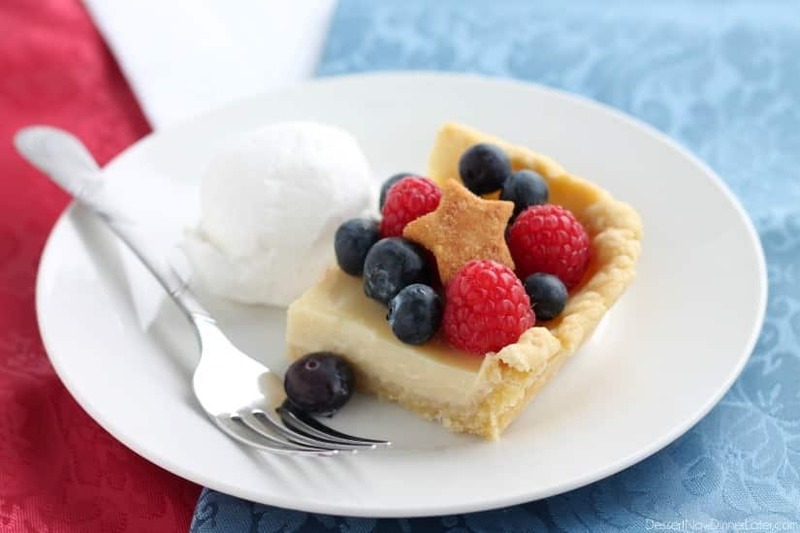 I love red white and blue desserts. Thanks! 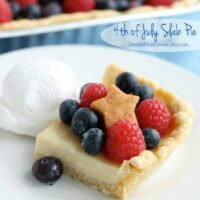 I love red white and blue desserts too! What a fun dessert! It looks incredible!